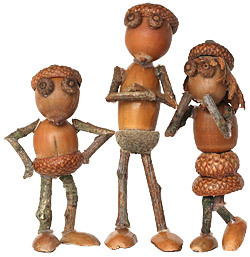 Few years ago I started creating animals and figures from chestnuts and acorns. Over time, I have improved the figures and their photography. In 2015 I started to share them on social networks, where they had great success. Photos of the toilet acorn elf probably flew around the entire internet world. I tried to make a wall calendar from the photographs and it was a quite successful achievement. After the end of the season, I was not able to say goodbye to these little creatures and I continued to produce them the entire winter and spring (luckily the kids had collected a large supply of material in the autumn). And so, the entertainment for kids became an entertainment for me.